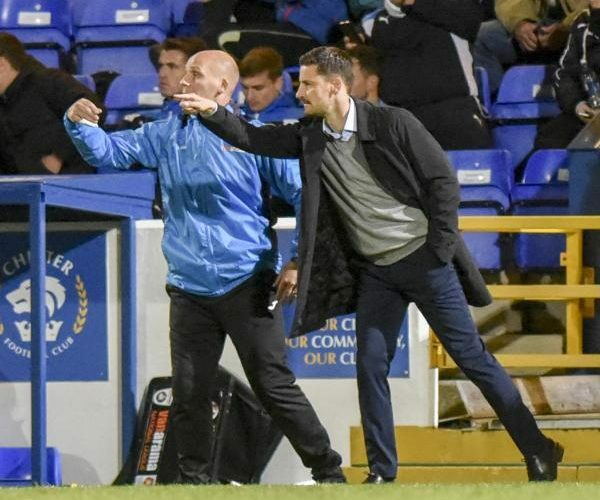 ANTHONY LIMBRICK was full of praise for his Woking players after the Cards rose to third in the Vanarama National League following a 2-0 victory at home to Chester on Tuesday evening. Kane Ferdinand put the visitors ahead in the tenth minute, before Jamie Philpot made it three consecutive games on the scoresheet when he sealed the points late on. After extending their unbeaten league run to five matches, Limbrick has praised the attitude of his side, who were only assembled in the summer, less than three months ago. Woking dominated the opening period, and were ahead when Ferdinand headed in Matt Young’s cross for his first away goal for the club, and is pleased that their playing well and picking up results. He said: “We might recall me saying a few weeks ago that we need to find a formula away from home and we’re doing that now. We’re in good spirit and good form and delighted with the win. Despite his standout performance in the centre of midfield, Limbrick has targeted improvement from the 24-year-old, who signed from East Thurrock United in December 2016. Philpot continued his rich vein of form in front of goal, and after moving ahead of Inih Effiong, Limbrick has praised the strength in depth that his side, which has seen them to eight wins so far. One of those players was Joe Ward, who was rested, and captain Richard Orlu, who made his return to the bench. There was also a start for Fabio Saraiva, and Limbrick was satisfied with his performance. He added: “That shows the good work that’s been done by the physio and the strength and conditioning coach to get Fabio Saraiva up to fitness and able to manage a game at this level. Saraiva played 71 minutes before he was replaced by Academy graduate Lazar Stojsavljevic, who made his debut for Woking at left-back, and Limbrick revealed how the defender showed more fear at his team initiation rather than on the pitch.